I absolutely loved Fallout 3 from last gen, it's probably one of my favourite games on my Xbox 360. To say I was excited for Fallout 4 would've been a bit of an understatement, so when it finally got added to my library I was eager to dig in and play. 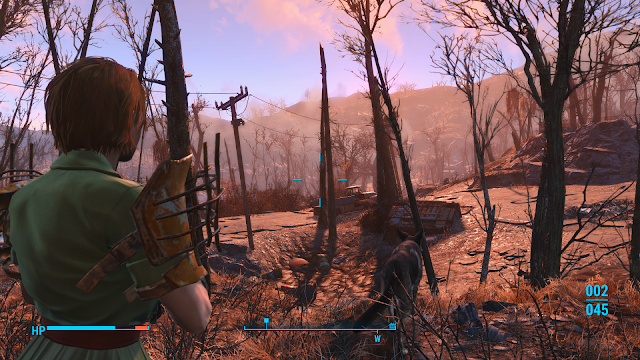 What seems to be an alarming trend in newly released Bethesda games though, are tons of bugs and bad performance all over the board. The console versions on Xbox One and PlayStation 4 suffered the most. I decided to wait it out and let the patches roll out before jumping in. A few fixes later and a lucky Christmas sale, which gave me the game plus a season pass for the price of the ordinary game, I was set! The massive visual upgrade and the magnificent, yet shocking, introduction level further built my excitement up. A lot of people had complained about the visuals, for me personally I was very very impressed the first time I booted it up. Sure it's not always appealing on details far into the distance and the character animations are stiff and look like they all came from an uncanny valley convention. But all in all, I really think Bethesda has done a great job visually. Especially when we consider the huge playing area and the incredible lighting and weather effects. However, technically we are once again witnessing insane load times between the open world and indoors locations. Which makes entering and exiting buildings a tedious affair. Killing the pace and flow when you're excited about moving on quickly. Witnessing these exact same loadtimes in console versions of Fallout 3, Fallout: New Vegas and Skyrim, I am further disappointed in the developer for not fixing this jarring issue. The same goes for the inconsistent framerate, though it's nowhere near the alarmingly low and single digit(!) numbers Skyrim reached on the PS3. F4 struggles in crowded fights and visually taxing scenes. Bethesda perhaps needs to take a long hard look at this ageing game engine and consider beginning from scratch?! F4 does a lot of things right though, crucial details that made F3 a classic for me. The atmosphere is incredible once again. The brutal aftermath of society's fall makes living and surviving the post-apocalyptic world the nightmare one would expect it to be. 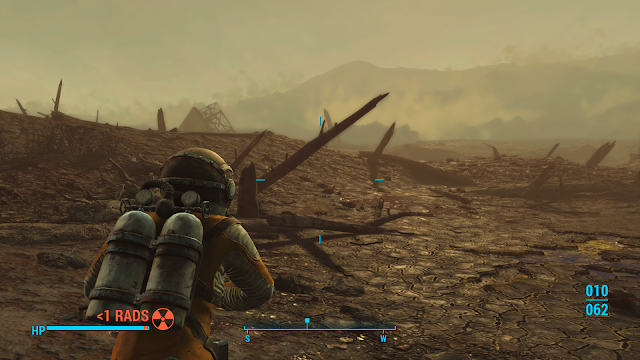 The nasty creatures that have mutated up from the radiation, the anarchy that has risen and the harsh "kill or be killed" mentality of the wasteland. There's a fascinating, yet disturbing, vision of how our world could have been, or could be if everything is pulled apart. F4 retains this scenario in a great way and sets you in a world built for more powerful consoles to depict this dark futuristic vision. I still love the 1950's inspired setting, forever stuck in the era when the atomic age rose and the a-bombs fell. 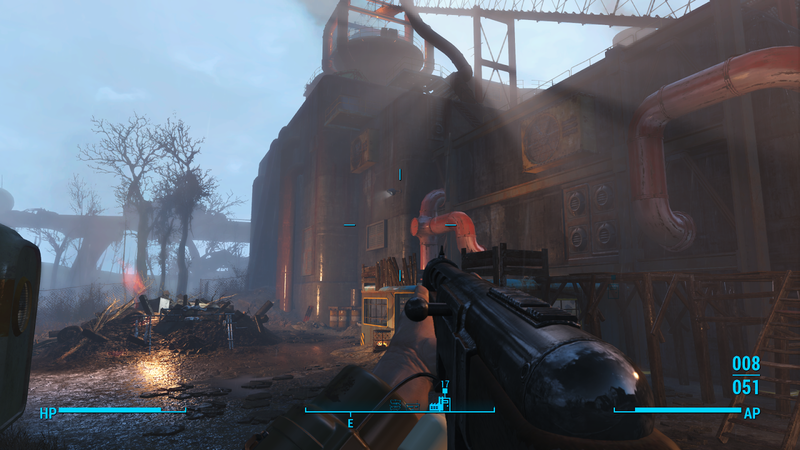 Added to further envision this dark future is dynamic lighting and weather. Watching beautiful sunsets or battling it out in pouring, radiated rain makes it even easier to submerge yourself into F4's dismal world. Great atmosphere alone isn't a saviour by itself though, there are numerous elements that brought down my excitement after being initially impressed. Dialogue options seem dumbed down to the point of simply agreeing in various forms when they want to move the story along. Rather than giving you a wide range of directions the dialogue and subsequent plotline can develop into. I also disliked the vast amount of too bright and colourful indoor environments. 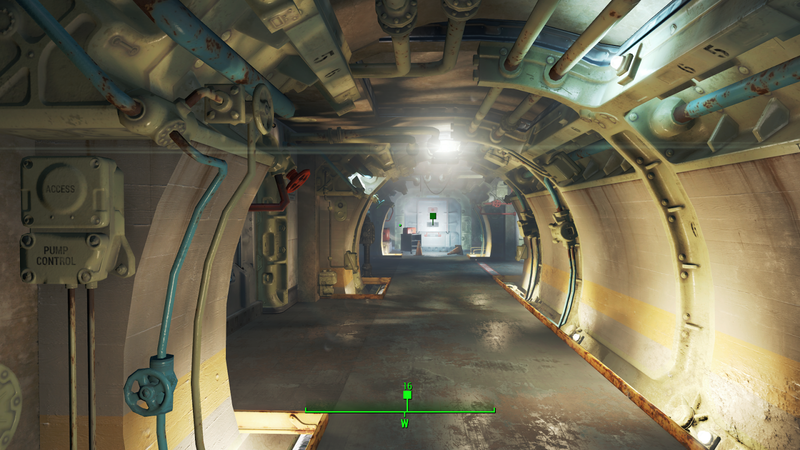 Some of them simply look to modern to be a 1950's believable world and lose the creepy feeling F3 cleverly gave the player when entering claustrophobic indoor environments. Another annoynance for me was the almost nagging persistence the game had in making you recruit into one of the factions in the game. Joining one of them leads to sidemissions which mainly involve building endless stuff like buildings, furniture and electric contraptions. For me the building mode was totally uninteresting. I simply, want to be alone and away from stupid AI in the vast post-apocalyptic world. 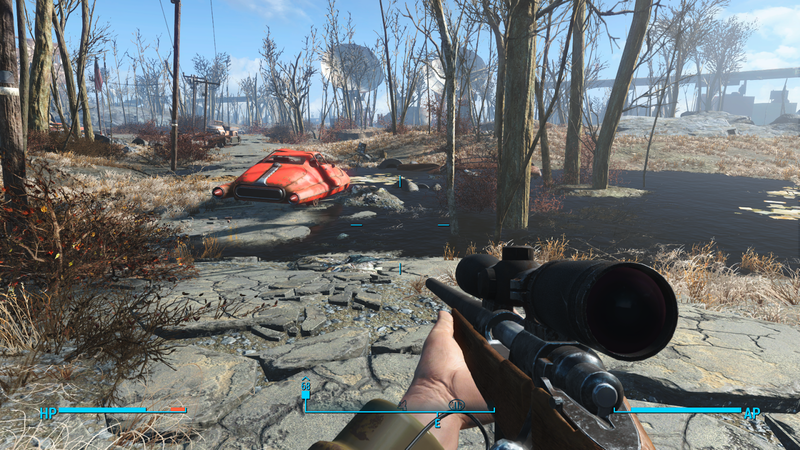 Exploringstuff on my own, not building tons of crap for some settlement I really don't care about. The building and crafting is obligatory to completing certain tasks, sadly. I guess the crafting trend in games just isn't something that interests me much, with Minecraft being an exception. People whom enjoy this though, can overlook this complaint. So I was left with tasks I didn't want to do, in a world where the story seemed pre-determined beyond my influence. In a role playing game this felt restrictive. Sure one could argue that a game needs to follow certain paths to end up somewhere with it's story. Just don't make me enter conversations where I basically have the option of saying "yes" in four different ways. There needs to be radically different choices. As such the plot twists, and in general, the main story never really blew my mind or eagerly caught my attention. 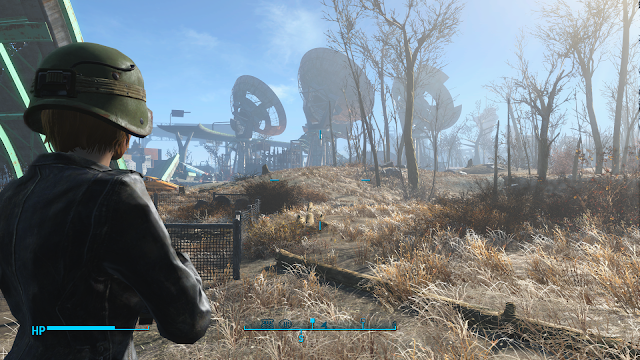 Though I'd argue that the Fallout games are mostly about making your own stories and experiences in the wasteland. The excitement lies in the smaller details and random encounters you come across. I came in wanting this game to be all that F3 was, at least the atmospheric experience, but I left with something else. Sure, it has it's fantastic moments and if you have no history with the previous games then it's probably fine to start here. As a whole though, it doesn't deliver the hype it built itself up to be. At times F3 almost felt like a survival horror for me; creepy dark places filled with ghouls that really freaked me out whenever I fared indoors or underground. In F4 everything looks and feels too bright and positive to capture that scary atmosphere. That's my visual opinion though, the actual game still has all the gameplay elements F3 offered and perfectly captures the atomic era design. The gun feeling especially, is vastly improved and feels much more like a proper first person shooter than before. Storywise, however, there's nothing really captivating here and the feeling of making critical choices in dialogues feels bland. I leave Fallout 4 with mixed feelings, and as such, I am less interested in a possible next instalment. To improve on the series I feel the technical side needs to be vastly optimized, with greatly improved loading and animation. Far more depth to dialogue options that will send the story in multiple directions. Even a coop to roam the wastelands would be an awesome idea. 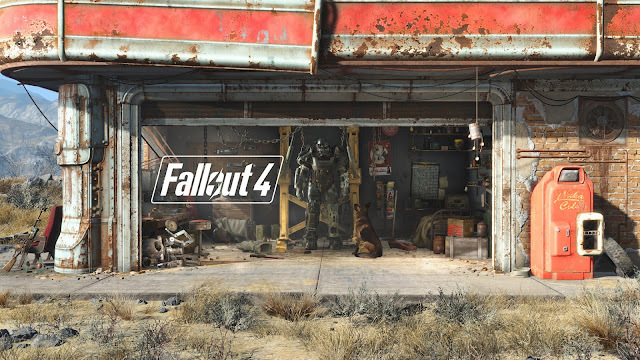 Fallout 4 though, leaves the fans kind of disappointed, while newcomers will probably fit in nicely. Good, but not good enough to leave a strong impression. Incredible atmospheric world with added weather and great dynamic lighting. Tons of places to explore, buildings to go into and equipment to find. Setting is still fairly unique for the series and unrivalled. Discovering buildings will be reset by sidemissions to the same location. Horrible loading times when entering or exiting buildings. Building/crafting things are not my thing, and it's forced onto the player. Rebooting the doomed, to hell and back.